From 45 to 130 € the night I book ! 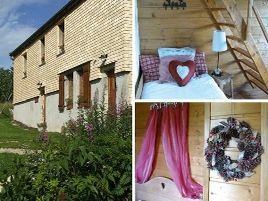 An ancestral home, opening onto meadows and forests in the heart of the 'Haut-Jura' regional park, completely refurbished harmonising comfort with the authenticity of wood and stone. The delightful rooms have all the comfort you could wish for! Delicious breakfasts and guest meals with family and local specialties. Warm, ready welcome. A wonderful address!. - Ski de fond sur place. - Pêche à 1 km dans la Semine et la Bienne. 2 rooms with shower and WC. 35 euros (1 pers. ), 65 to 70 euros (2 pers. ), 85 to 100 euros (3 pers. ), 130 euros(4 pers.). Extra bed 20 euros. Baby equipment, games, children's meals. For teenagers: table tennis, mountain biking, cross-country skiing, snow-shoeing, dog-sleighs. Children very welcome. The closest station is Bellegarde TGV, located at 35 km. The closest airport is Genève, to 60 km.